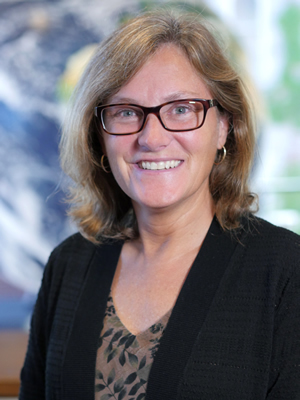 Linda Ivany, professor of Earth sciences in the College of Arts and Sciences (A&S), is the lead author of an article in Science Advances (American Association for the Advancement of Science, 2018). Her team’s research is the first to address the effects of the Paleocene-Eocene Thermal Maximum (PETM)—a relatively brief period of global climate change, spanning 200,000 years—on marine invertebrates, including snails, clams and other mollusks. “The response of ecosystems [to the PETM] has been well documented for marine plankton, terrestrial plants and land vertebrates, but, until now, almost nothing has been published on marine shelf faunas,” Ivany says. “This is because the stratigraphic record, showing where marine invertebrates are preserved on the continental margins, is full of gaps because of erosion. The chances of preserving a short-duration event, such as the PETM, are small. 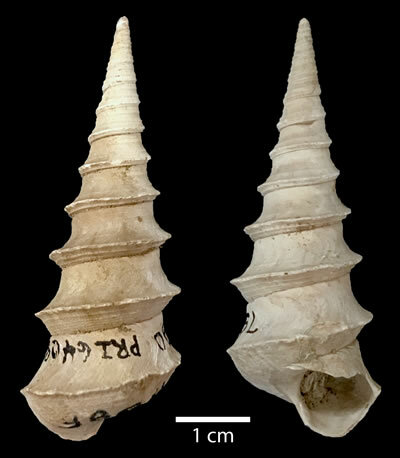 The large, iconic gastropod “Turritella postmortoni” from Alabama, one such mollusk that went extinct at the PETM. Ivany figured that if her team could not “see” the effects of climate change in the geologic record, they could do the next best thing—look for them in sediment straddling the PETM. Turning their attention to the rich, well-preserved shell beds of the U.S. Gulf Coastal Plain, the team sought out evidence of ancient bivalves, gastropods and scaphopods. Co-author Warren Allmon says scientists have long presumed the PETM on the Coastal Plain to be a tome of major biological change. “Our study shows the importance of testing ideas we think we’re sure of. Some organisms changed a lot across the Paleocene-Eocene Boundary, but most did not,” explains Allmon, who doubles as the director of the Paleontological Research Institution in Ithaca, New York, and the Hunter R. Rawlings III Professor of Paleontology at Cornell University. There were exceptions, of course. Witness the abundance of marine life below the sediment surface, instead of on it. A large number of invertebrates also engaged in microbial symbiosis—interactions enabling them to profit from chemicals in the sediment, released by the decomposition of organic matter. “These characteristics are what one might expect from low-oxygen conditions typical of a super-greenhouse world,” Ivany adds. Ivany (far right) with co-authors Rowan Lockwood (third from left) and Jocelyn Sessa (third from right), professors at William & Mary and Drexel, respectively. 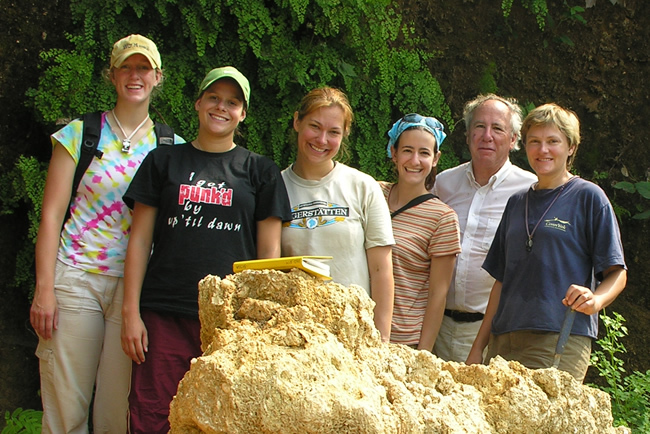 Also pictured is Lauck “Buck” Ward (second from right), curator emeritus of invertebrate paleontology at the Virginia Museum of Natural History. Potentially good news, from an evolutionary and ecological perspective, as these mollusks must have figured out how to stay out of hot water. Ivany thinks they “got lucky.” In truth, their adaption to the prevailing warm conditions at the time, coupled with the slow release of carbon dioxide relative to the timescale of ocean mixing (i.e., distributions of heat, salt and chemicals), likely mollified the impact of global warming. “When the dust settled and the climate had cooled back down, our faunas had not changed all that much,” she says. Nevertheless, the PETM is one of the best ancient analogs of modern climate change. The geologic record shows that, during a roughly 5,000-year span, some kind of terrestrial source—sedimentary, or volcanic, or both—pumped thousands of billions of tons of carbon into the atmosphere. This raised global marine temperatures by as much as 15 degrees Fahrenheit, triggering severe extinctions in the deep sea, as well as wholesale ecological reorganization on land. The PETM likely was a perfect storm of global warming, acidification and oxygen stress. “Several things happen when you put large amounts of carbon in the atmosphere—the Earth gets warmer, and some of the carbon dioxide dissolves into the ocean, raising the acidity level near the surface,” Ivany continues. “The warmer the water, the less oxygen it holds. All of these changes have consequences for marine life. We are seeing these same things today, along with their increasing effects on ecosystems. The paper’s co-authors include Jocelyn Sessa, a former postdoctoral scholar at Syracuse who is assistant professor of biodiversity, Earth and environmental science at Drexel University, where she also is an assistant curator at The Academy of Natural Sciences. Other co-authors are faculty members at the University of Rochester, the College of William & Mary and San Jose State University.